"Copernicus" and "Kopernik" redirect here. For other uses, see Copernicus (disambiguation). The publication of Copernicus' model in his book De revolutionibus orbium coelestium (On the Revolutions of the Celestial Spheres), just before his death in 1543, was a major event in the history of science, triggering the Copernican Revolution and making a pioneering contribution to the Scientific Revolution. Copernicus' father's family can be traced to a village in Silesia near Nysa (Neiße). The village's name has been variously spelled Kopernik,[f] Copernik, Copernic, Kopernic, Coprirnik, and today Koperniki. 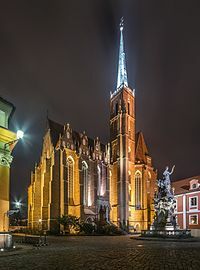 In the 14th century, members of the family began moving to various other Silesian cities, to the Polish capital, Kraków (1367), and to Toruń (1400). The father, Mikołaj the Elder, likely the son of Jan, came from the Kraków line. Copernicus is postulated to have spoken Latin, German, and Polish with equal fluency; he also spoke Greek and Italian, and had some knowledge of Hebrew. [j][k][l][m] The vast majority of Copernicus's extant writings are in Latin, the language of European academia in his lifetime. The surname Kopernik, Copernik, Koppernigk is recorded in Kraków from c. 1350, in various spellings, apparently given to people from the village of Koperniki (prior to 1845 rendered Kopernik, Copernik, Copirnik and Koppirnik) in the Duchy of Nysa. Nicolas Copernicus' great-grandfather is recorded as having received citizenship in Kraków in 1386. The toponym Kopernik (modern Koperniki) has been variously tied to the Polish word for dill (koper) and German for copper (Kupfer). [p] The suffix -nik (or plural -niki) denotes a Slavic and Polish agent noun, though. Upon his father's death, young Nicolaus' maternal uncle, Lucas Watzenrode the Younger (1447–1512), took the boy under his wing and saw to his education and career. Watzenrode maintained contacts with leading intellectual figures in Poland and was a friend of the influential Italian-born humanist and Kraków courtier, Filippo Buonaccorsi. There are no surviving primary documents on the early years of Copernicus's childhood and education. Copernicus biographers assume that Watzenrode first sent young Copernicus to St. John's School, at Toruń, where he himself had been a master. Later, according to Armitage,[s] the boy attended the Cathedral School at Włocławek, up the Vistula River from Toruń, which prepared pupils for entrance to the University of Kraków, Watzenrode's alma mater in Poland's capital. 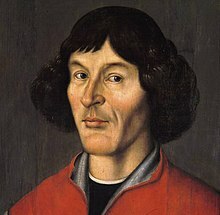 On 20 October 1497, Copernicus, by proxy, formally succeeded to the Warmia canonry which had been granted to him two years earlier. 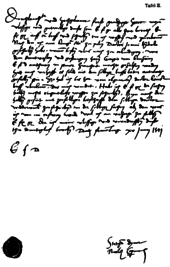 To this, by a document dated 10 January 1503 at Padua, he would add a sinecure at the Collegiate Church of the Holy Cross and St. Bartholomew in Wrocław (at the time in the Kingdom of Bohemia). Despite having been granted a papal indult on 29 November 1508 to receive further benefices, through his ecclesiastic career Copernicus not only did not acquire further prebends and higher stations (prelacies) at the chapter, but in 1538 he relinquished the Wrocław sinecure. It is unclear whether he was ever ordained a priest. Edward Rosen asserts that he was not. Copernicus did take minor orders, which sufficed for assuming a chapter canonry. The Catholic Encyclopedia proposes that his ordination was probable, as in 1537 he was one of four candidates for the episcopal seat of Warmia, a position which required ordination. 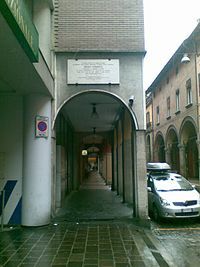 "Here, where stood the house of Domenico Maria Novara, professor of the ancient Studium of Bologna, NICOLAUS COPERNICUS, the Polish mathematician and astronomer who would revolutionize concepts of the universe, conducted brilliant celestial observations with his teacher in 1497–1500. Placed on the 5th centenary of [Copernicus's] birth by the City, the University, the Academy of Sciences of the Institute of Bologna, the Polish Academy of Sciences. 1473 [–] 1973." On his return journey doubtless stopping briefly at Bologna, in mid-1501 Copernicus arrived back in Warmia. After on 28 July receiving from the chapter a two-year extension of leave in order to study medicine (since "he may in future be a useful medical advisor to our Reverend Superior [Bishop Lucas Watzenrode] and the gentlemen of the chapter"), in late summer or in the fall he returned again to Italy, probably accompanied by his brother Andrew[t] and by Canon Bernhard Sculteti. This time he studied at the University of Padua, famous as a seat of medical learning, and—except for a brief visit to Ferrara in May–June 1503 to pass examinations for, and receive, his doctorate in canon law—he remained at Padua from fall 1501 to summer 1503. In his younger days, Copernicus the physician had treated his uncle, brother and other chapter members. In later years he was called upon to attend the elderly bishops who in turn occupied the see of Warmia—Mauritius Ferber and Johannes Dantiscus—and, in 1539, his old friend Tiedemann Giese, Bishop of Chełmno (Kulm). In treating such important patients, he sometimes sought consultations from other physicians, including the physician to Duke Albert and, by letter, the Polish Royal Physician. 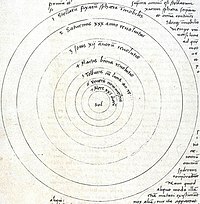 Some time before 1514 Copernicus made available to friends his "Commentariolus" ("Little Commentary"), a manuscript describing his ideas about the heliocentric hypothesis. [u] It contained seven basic assumptions (detailed below). Thereafter he continued gathering data for a more detailed work. Copernicus was reportedly buried in Frombork Cathedral, where a 1580 epitaph stood until being defaced; it was replaced in 1735. For over two centuries, archaeologists searched the cathedral in vain for Copernicus' remains. Efforts to locate them in 1802, 1909, 1939 had come to nought. In 2004 a team led by Jerzy Gąssowski, head of an archaeology and anthropology institute in Pułtusk, began a new search, guided by the research of historian Jerzy Sikorski. In August 2005, after scanning beneath the cathedral floor, they discovered what they believed to be Copernicus's remains. Copernicus owned a copy of Giorgio Valla's De expetendis et fugiendis rebus, which included a translation of Plutarch's reference to Aristarchus's heliostaticism. Mathematical techniques developed in the 13th to 14th centuries by Mo'ayyeduddin al-Urdi, Nasir al-Din al-Tusi, and Ibn al-Shatir for geocentric models of planetary motions closely resemble some of those used later by Copernicus in his heliocentric models. Copernicus used what is now known as the Urdi lemma and the Tusi couple in the same planetary models as found in Arabic sources. Furthermore, the exact replacement of the equant by two epicycles used by Copernicus in the Commentariolus was found in an earlier work by Ibn al-Shatir (d. c. 1375) of Damascus. Ibn al-Shatir's lunar and Mercury models are also identical to those of Copernicus. This has led some scholars to argue that Copernicus must have had access to some yet to be identified work on the ideas of those earlier astronomers. Since the Tusi couple was used by Copernicus in his reformulation of mathematical astronomy, many scholars suggested that he became aware of this idea in some way. It has been suggested that the idea of the Tusi couple may have arrived in Europe leaving few manuscript traces, since it could have occurred without the translation of any Arabic text into Latin. One possible route of transmission may have been through Byzantine science, which translated some of al-Tusi's works from Arabic into Byzantine Greek. Several Byzantine Greek manuscripts containing the Tusi couple are still extant in Italy. Other scholars have argued that Copernicus could well have developed these ideas independently of the late Islamic tradition. Nevertheless, Copernicus cited some of the Islamic astronomers whose theories and observations he used in De Revolutionibus, namely al-Battani, Thabit ibn Qurra, al-Zarqali, Averroes, and al-Bitruji. The prevailing theory in Europe during Copernicus's lifetime was the one that Ptolemy published in his Almagest c. 150 CE; the Earth was the stationary center of the universe. Stars were embedded in a large outer sphere which rotated rapidly, approximately daily, while each of the planets, the Sun, and the Moon were embedded in their own, smaller spheres. Ptolemy's system employed devices, including epicycles, deferents and equants, to account for observations that the paths of these bodies differed from simple, circular orbits centered on the Earth. Despite the near universal acceptance later of the heliocentric idea (though not the epicycles or the circular orbits), Copernicus's theory was originally slow to catch on. Scholars hold that sixty years after the publication of The Revolutions there were only around 15 astronomers espousing Copernicanism in all of Europe: "Thomas Digges and Thomas Harriot in England; Giordano Bruno and Galileo Galilei in Italy; Diego Zuniga in Spain; Simon Stevin in the Low Countries; and in Germany, the largest group—Georg Joachim Rheticus, Michael Maestlin, Christoph Rothmann (who may have later recanted), and Johannes Kepler." Additional possibilities are Englishman William Gilbert, along with Achilles Gasser, Georg Vogelin, Valentin Otto, and Tiedemann Giese. Arthur Koestler, in his popular book The Sleepwalkers, asserted that Copernicus's book had not been widely read on its first publication. This claim was trenchantly criticised by Edward Rosen,[y] and has been decisively disproved by Owen Gingerich, who examined nearly every surviving copy of the first two editions and found copious marginal notes by their owners throughout many of them. Gingerich published his conclusions in 2004 in The Book Nobody Read. Photograph of a 16th-century portrait of Copernicus – the original painting was looted, and possibly destroyed, by the Germans in World War II during the occupation of Poland. The first notable to move against Copernicanism was the Magister of the Holy Palace (i.e., the Catholic Church's chief censor), Dominican Bartolomeo Spina, who "expressed a desire to stamp out the Copernican doctrine". But with Spina's death in 1546, his cause fell to his friend, the well known theologian-astronomer, the Dominican Giovanni Maria Tolosani of the Convent of St. Mark in Florence. Tolosani had written a treatise on reforming the calendar (in which astronomy would play a large role) and had attended the Fifth Lateran Council (1512–1517) to discuss the matter. He had obtained a copy of De Revolutionibus in 1544. His denunciation of Copernicanism was written a year later, in 1545, in an appendix to his unpublished work, On the Truth of Sacred Scripture. Rheticus' hopes were dashed when six years after the publication of De Revolutionibus Melanchthon published his Initia Doctrinae Physicae presenting three grounds to reject Copernicanism. These were "the evidence of the senses, the thousand-year consensus of men of science, and the authority of the Bible". Blasting the new theory Melanchthon wrote, "Out of love for novelty or in order to make a show of their cleverness, some people have argued that the earth moves. They maintain that neither the eighth sphere nor the sun moves, whereas they attribute motion to the other celestial spheres, and also place the earth among the heavenly bodies. Nor were these jokes invented recently. There is still extant Archimedes' book on The Sand Reckoner; in which he reports that Aristarchus of Samos propounded the paradox that the sun stands still and the earth revolves around the sun. Even though subtle experts institute many investigations for the sake of exercising their ingenuity, nevertheless public proclamation of absurd opinions is indecent and sets a harmful example." Melanchthon went on to cite Bible passages and then declare "Encouraged by this divine evidence, let us cherish the truth and let us not permit ourselves to be alienated from it by the tricks of those who deem it an intellectual honor to introduce confusion into the arts." In the first edition of Initia Doctrinae Physicae, Melanchthon even questioned Copernicus's character claiming his motivation was "either from love of novelty or from desire to appear clever", these more personal attacks were largely removed by the second edition in 1550. Copernicus' 2010 gravestone in Frombork Cathedral. Another Protestant theologian who disparaged heliocentrism on scriptural grounds was John Owen. In a passing remark in an essay on the origin of the sabbath, he characterised "the late hypothesis, fixing the sun as in the centre of the world" as being "built on fallible phenomena, and advanced by many arbitrary presumptions against evident testimonies of Scripture." On the orders of Pope Paul V, Cardinal Robert Bellarmine gave Galileo prior notice that the decree was about to be issued, and warned him that he could not "hold or defend" the Copernican doctrine. [z] The corrections to De revolutionibus, which omitted or altered nine sentences, were issued four years later, in 1620. Copernicus is honored, together with Johannes Kepler, in the liturgical calendar of the Episcopal Church (US), with a feast day on 23 May. ^ The oldest known portrait of Copernicus is that on Strasbourg astronomical clock, made by Tobias Stimmer c. 1571–74. According to the inscription next to the portrait, it was made from a self-portrait by Copernicus himself. This has led to speculation that the Torun portrait may be a copy based on the same self-portrait, but its provenance is unknown. ^ Modern pronunciation of the Polish form of the name: [mʲiˈkɔwaj kɔˈpɛrɲik] ( listen). ^ The Greek mathematician and astronomer Aristarchus of Samos proposed such a system during the third century BCE. (Dreyer 1953, pp. 135–48). Copernicus was aware of Aristarchus' heliocentric theory and cited him in an early (unpublished) manuscript of De Revolutionibus (which still survives), though he removed the reference from his final published manuscript. ^ Dava Sobel writes: "Copernicus had no idea that Aristarchus of Samos had proposed much the same thing [as Copernicus was contemplating by 1510, when he wrote his Brief Sketch, otherwise also known as the Commentariolus] in the third century B.C. The only work by Aristarchus known to Copernicus—a treatise called On the Sizes and Distances of the Sun and Moon—made no mention of a heliocentric plan." Sobel (2011) pp. 18–19. Sobel further writes that in Copernicus' dedication of On the Revolutions to Pope Paul III—which Copernicus hoped would dampen criticism of his heliocentric theory by "babblers... completely ignorant of [astronomy]"—the book's author wrote that, in rereading all of philosophy, in the pages of Cicero and Plutarch he had found references to those few thinkers who dared to move the Earth "against the traditional opinion of astronomers and almost against common sense." Sobel comments: "He still knew nothing of the Earth-moving plan of Aristarchus, which had not yet been reported to Latin audiences." (pp. 179–82). ^ "Copernicus seems to have drawn up some notes [on the displacement of good coin from circulation by debased coin] while he was at Olsztyn in 1519. He made them the basis of a report on the matter, written in German, which he presented to the Prussian Diet held in 1522 at Grudziądz... He later drew up a revised and enlarged version of his little treatise, this time in Latin, and setting forth a general theory of money, for presentation to the Diet of 1528." ^ "The name of the village, not unlike that of the astronomer's family, has been variously spelled. A large German atlas of Silesia, published by Wieland in Nuremberg in 1731, spells it Kopernik." ^ "In 1512, Bishop Watzenrode died suddenly after attending King Sigismund's wedding feast in Kraków. Rumors abounded that the bishop had been poisoned by agents of his long-time foe, the Teutonic Knights." ^ "[Watzenrode] was also firm, and the Teutonic Knights, who remained a constant menace, did not like him at all; the Grand Master of the order once described him as 'the devil incarnate'. [Watzenrode] was the trusted friend and advisor of three [Polish] kings in succession: John Albert, Alexander (not to be confused with the poisoning pope), and Sigismund; and his influence greatly strengthened the ties between Warmia and Poland proper." ^ "To obtain for his nephews [Nicolaus and Andreas] the necessary support [for their studies in Italy], the bishop [Lucas Watzenrode the Younger] procured their election as canons by the chapter of Frauenburg (1497–1498)." ^ "He spoke German, Polish and Latin with equal fluency as well as Italian." ^ "He spoke Polish, Latin, and Greek." ^ "He was a linguist with a command of Polish, German and Latin, and he possessed also a knowledge of Greek rare at that period in northeastern Europe and probably had some acquaintance with Italian and Hebrew." ^ He used Latin and German, knew enough Greek to translate the 7th-century Byzantine poet Theophylact Simocatta's verses into Latin prose, and "there is ample evidence that he knew the Polish language." Edward Rosen mentions that Copernicus recorded Polish farm tenants' names inconsistently, gainsaying that he was fluent in the Polish language. (But decades after Copernicus, each of William Shakespeare's extant autograph signatures showed a different spelling.) During his several years' studies in Italy, Copernicus presumably learned some Italian; Professor Stefan Melkowski of Nicolaus Copernicus University in Toruń asserts that Copernicus also spoke both German and Polish. ^ "Although great importance has frequently been ascribed to this fact, it does not imply that Copernicus considered himself to be a German. The 'nationes' of a medieval university had nothing in common with nations in the modern sense of the word. Students who were natives of Prussia and Silesia were automatically described as belonging to the Natio Germanorum. Furthmore, at Bologna, this was the 'privileged' nation; consequently, Copernicus had very good reason for inscribing himself on its register." ^ "It is important to recognize, however, that the medieval Latin concept of natio, or "nation", referred to the community of feudal lords both in Germany and elsewhere, not to 'the people' in the nineteenth-century democratic or nationalistic sense of the word." ^ These interpretations date to the dispute about Copernicus' (Polish vs. German) ethnicity, which had been open since the 1870s, and both the "copper" vs. "dill" interpretations go back to the 19th century, (Magazin für die Literatur des Auslandes, 1875, 534f), but the dispute became virulent once again in the 1960s, culminating in a controversy between E. Mosko ("copper") and S. Rospond ("dill") during 1963/4, summarized by Zygmunt Brocki, "Wsrôd publikacji o etymologii nazwiska Mikotaja Kopernika [Among the publications on the etymology of the name of Nicholas Copernicus]" Komunikaty mazur.-warm., 1970). ^ "In the [enrollment] documents still in existence we find the entry: Nicolaus Nicolai de Torunia." ^ Dobrzycki and Hajdukiewicz (1969) describe Copernicus having attended school at Włocławek as unlikely. 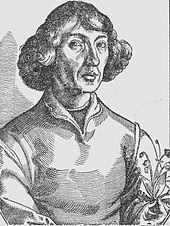 ^ Copernicus' brother Andreas would, before the end of 1512, develop leprosy and be forced to leave Warmia for Italy. In November 1518 Copernicus would learn that his brother had died. ^ A reference to the "Commentariolus" is contained in a library catalogue, dated 1 May 1514, of a 16th-century historian, Matthew of Miechów, so it must have begun circulating before that date (Koyré, 1973, p. 85; Gingerich, 2004, p. 32). Thoren (1990 p. 99) gives the length of the manuscript as 40 pages. ^ According to Bell 1992, p. 111, "[…] Copernicus, on his deathbed, received the printer's proofs of his epoch-breaking Dē revolutionibus orbium coelestium." ^ Koestler 1963, page 189, says the following about a letter from Canon Tiedemann Giese to Georg Joachim Rheticus: "[…] the end came only after several months, on 24 May. In a letter to Rheticus, written a few weeks later, Giese recorded the event in a single, tragic sentence: 'For many days he had been deprived of his memory and mental vigour; he only saw his completed book at the last moment, on the day he died.'" Koestler attributes this quotation to Leopold Prowe, Nicolaus Copernicus, Berlin 1883–1884, volume 1, part 2, p. 554. ^ Fantoli (2005, pp. 118–19); Finocchiaro (1989, pp. 148, 153). On-line copies of Finocchiaro's translations of the relevant documents, Inquisition Minutes of 25 February 1616 and Cardinal Bellarmine's certificate of 26 May 1616, have been made available by Gagné (2005). This notice of the decree would not have prevented Galileo from discussing heliocentrism solely as a mathematical hypothesis, but a stronger formal injunction (Finocchiaro, 1989, pp. 147–48) not to teach it "in any way whatever, either orally or in writing", allegedly issued to him by the Commissary of the Holy Office, Father Michelangelo Segizzi, would certainly have done so (Fantoli, 2005, pp. 119–20, 137). There has been much controversy over whether the copy of this injunction in the Vatican archives is authentic; if so, whether it was ever issued; and if so, whether it was legally valid (Fantoli, 2005, pp. 120–43). ^ André Goddu, Copernicus and the Aristotelian Tradition (2010), p. 436 (note 125), citing Goddu, review of: Jerzy Gassowski, Poszukiwanie grobu Mikolaja Kopernika in: Journal for the History of Astronomy 38.2 (May 2007), p. 255. ^ "Copernicus". Dictionary.com Unabridged. Random House. ^ Linton 2004, pp. 39, 119. ^ a b Owen Gingerich, "Did Copernicus Owe a Debt to Aristarchus? ", Journal for the History of Astronomy, vol. 16, no. 1 (February 1985), pp. 37–42. ^ Edward Rosen, "Copernicus, Nicolaus", Encyclopedia Americana, International Edition, volume 7, Danbury, Connecticut, Grolier Incorporated, 1986, ISBN 0-7172-0117-1, pp. 755–56. ^ Angus Armitage, The World of Copernicus, 1951, p. 91. ^ Iłowiecki, Maciej (1981). Dzieje nauki polskiej (in Polish). Warszawa: Wydawnictwo Interpress. p. 40. ISBN 978-83-223-1876-8. ^ a b Sheila Rabin. "Nicolaus Copernicus". Stanford Encyclopedia of Philosophy. Retrieved 22 April 2007. ^ a b c d e f g h i j k l m n o p q r s Dobrzycki and Hajdukiewicz (1969), p. 4. ^ a b c d e Dobrzycki and Hajdukiewicz (1969), p. 3. ^ Moore (1994), pp. 52, 62. ^ a b c d e f g h i Dobrzycki and Hajdukiewicz (1969), p. 5. ^ Wojciech Iwanczak (1998). "Watzenrode, Lucas". In Bautz, Traugott. Biographisch-Bibliographisches Kirchenlexikon (BBKL) (in German). 13. Herzberg: Bautz. col. 389–93. ISBN 3-88309-072-7. ^ Moore (1994), p. 62. ^ "Nicolaus Copernicus" , New Advent (online version of the 1913 Catholic Encyclopedia). Retrieved 9 June 2013. ^ a b Angus Armitage, The World of Copernicus, pp. 75–77. ^ Davies, Norman (2005). God's playground. A History of Poland in Two Volumes. II. Oxford University Press. p. 26. ISBN 978-0-19-925340-1. ^ Edward Rosen, Nicolaus Copernicus Thorunensis. ^ Sidney Lee, Shakespeare's Handwriting: Facsimiles of the Five Authentic Autograph Signatures, London, Smith Elder, 1899. ^ Melkowski, Stefan (May 2003). "O historii i o współczesności" [On History and the Present Day] (in Polish). Archived from the original on 24 January 2004. Retrieved 22 April 2007. ^ a b Rosen (1995, p. 127). ^ a b Gingerich (2004), p. 143. ^ Moore (1994), p. 50. ^ a b c Czesław Miłosz, The History of Polish Literature, p. 38. ^ Sobel (2011), pp. 7, 232. ^ Jerzy Dobrzycki and Leszek Hajdukiewicz, "Kopernik, Mikołaj", Polski słownik biograficzny (Polish Biographical Dictionary), vol. XIV, Wrocław, Polish Academy of Sciences, 1969, p. 5. ^ Rosen, Ed (December 1960). "Copernicus was not a priest" (PDF). Proc. Am. Philos. Soc. 104 (6). Archived from the original (PDF) on 29 October 2013. ^ Rosen, Edward (1995). "Chapter 6: Copernicus' Alleged Priesthood". In Hilfstein, Erna. Copernicus and his successors. UK: The Hambledon Press. pp. 47–56. Bibcode:1995cops.book.....R. ISBN 978-1-85285-071-5. Retrieved 17 December 2014. ^ a b c d e f g h Dobrzycki and Hajdukiewicz (1969), p. 6. ^ Sobel (2011), pp. 26, 34, 40. ^ Gingerich (2004, pp. 187–89, 201); Koyré (1973, p. 94); Kuhn (1957, p. 93); Rosen (2004, p. 123); Rabin (2005). Robbins (1964, p. x), however, includes Copernicus among a list of Renaissance astronomers who "either practiced astrology themselves or countenanced its practice". ^ a b c d e Dobrzycki and Hajdukiewicz (1969), p. 7. ^ Volckart, Oliver (1997). "Early Beginnings of the Quantity Theory of Money and Their Context in Polish and Prussian Monetary Policies, c. 1520–1550". The Economic History Review. New Series. 50 (3): 430–49. doi:10.1111/1468-0289.00063. ^ a b c d e f Repcheck (2007), pp. 78–79, 184, 186. ^ a b c Dobrzycki and Hajdukiewicz (1969), p. 11. ^ "Schönberg, Nicholas, Letter to Nicolaus Copernicus, translated by Edward Rosen". ^ Dreyer (1953, p. 319). ^ Sobel (2011) p. 188. ^ Gąssowski, Jerzy (2005). "Poszukiwanie grobu Kopernika" [Searching for Copernicus' Grave]. www.astronomia.pl (in Polish). Grupa Astronomia. Archived from the original on 8 July 2014. Retrieved 7 December 2017. It results from the research of Dr. Jerzy Sikorski, an Olsztyn historian and an outstanding researcher of the life and work of Nicolaus Copernicus. According to Dr. Sikorski, the canon of the Frombork cathedral was buried in the immediate vicinity of this altar, which was entrusted to their care. This altar was the one who once wore the call of Saint Andrew, and now St. Cross, fourth in the right row. ^ a b Bogdanowicz, W.; Allen, M.; Branicki, W.; Lembring, M.; Gajewska, M.; Kupiec, T. (2009). "Genetic identification of putative remains of the famous astronomer Nicolaus Copernicus". PNAS. 106 (30): 12279–82. Bibcode:2009PNAS..10612279B. doi:10.1073/pnas.0901848106. PMC 2718376. PMID 19584252. ^ a b Easton, Adam (21 November 2008). "Polish tests 'confirm Copernicus'". BBC News. Retrieved 18 January 2010. 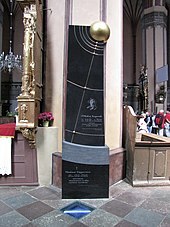 ^ a b "Copernicus's grave found in Polish church". USA Today. 3 November 2005. Retrieved 26 July 2012. ^ Bowcott, Owen (21 November 2008). "16th-century skeleton identified as astronomer Copernicus". The Guardian. Retrieved 18 January 2010. ^ Gingerich, O. (2009). "The Copernicus grave mystery". PNAS. 106 (30): 12215–16. Bibcode:2009PNAS..10612215G. doi:10.1073/pnas.0907491106. PMC 2718392. PMID 19622737. ^ "16th-century astronomer Copernicus reburied as hero in Poland". Cleveland Plain Dealer/Associated Press. 25 May 2010. ^ Dreyer (1953), pp. 40–52; Linton (2004, p. 20). ^ Dreyer (1953), pp. 123–35; Linton (2004, p. 24). ^ Heath (1913), p. 302. The italics and parenthetical comments are as they appear in Heath's original. ^ E.Rosen, Nicholaus Copernicus and Giorgio Valla, Physis. Rivista internazionale di Storia della Scienza, 23, 1981, pp. 449–57. ^ Saliba, George (1995-07-01). A History of Arabic Astronomy: Planetary Theories During the Golden Age of Islam. NYU Press. p. 31. ISBN 978-0-8147-8023-7. ^ a b c Young, M.J.L., ed. (2006-11-02). Religion, Learning and Science in the 'Abbasid Period. Cambridge University Press. p. 413. ISBN 978-0-521-02887-5. ^ Nasr, Seyyed Hossein (1993-01-01). An Introduction to Islamic Cosmological Doctrines. SUNY Press. p. 135. ISBN 978-1-4384-1419-5. ^ a b c Samsó, Julio (1970–80). "Al-Bitruji Al-Ishbili, Abu Ishaq". Dictionary of Scientific Biography. New York: Charles Scribner's Sons. ISBN 978-0-684-10114-9. ^ Saliba, George (1995-07-01). A History of Arabic Astronomy: Planetary Theories During the Golden Age of Islam. NYU Press. ISBN 978-0-8147-8023-7. ^ Swerdlow, Noel M. (1973-12-31). "The Derivation and First Draft of Copernicus's Planetary Theory: A Translation of the Commentariolus with Commentary". Proceedings of the American Philosophical Society. 117 (6): 423–512. Bibcode:1973PAPhS.117..423S. ISSN 0003-049X. JSTOR 986461. ^ Linton (2004, pp. 124,137–38), Saliba (2009, pp. 160–65), Swerdlow & Neugebauer (1984, pp. 46–48). ^ Claudia Kren, "The Rolling Device," p. 497. ^ George Saliba, "Whose Science is Arabic Science in Renaissance Europe?" ^ George Saliba (April 27, 2006). "Islamic Science and the Making of Renaissance Europe". Retrieved 2008-03-01. ^ Goddu (2010, pp. 261–69, 476–86), Huff (2010, pp. 263–64), di Bono (1995), Veselovsky (1973). ^ Freely, John (2015-03-30). Light from the East: How the Science of Medieval Islam Helped to Shape the Western World. I.B.Tauris. p. 179. ISBN 978-1-78453-138-6. ^ Gingerich, Owen (1997). "Ptolemy, Copernicus, and Kepler". The Eye of Heaven. Springer. pp. 3–51. 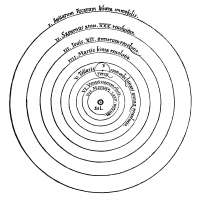 ^ Except for the circle labelled "V. Telluris" in the diagram from the printed edition, representing the orbital path of the Earth, and the first circle in both diagrams, representing the outer boundary of the universe, and of a presumed spherical shell of fixed stars, the numbered circles in the diagrams represent the boundaries of hypothetical spherical shells ("orbes" in Copernicus's Latin) whose motion was assumed to carry the planets and their epicycles around the Sun (Gingerich, 2014, pp. 36–38; 2016, pp. 34–35). ^ Sobel (2011), p. 18. ^ Dreyer, John L.E. (1906). History of the planetary systems from Thales to Kepler. Cambridge University Press. p. 342. ^ Sobel (2011), pp. 207–10. ^ DeMarco, Peter (13 April 2004). "Book quest took him around the globe". The Boston Globe. Retrieved 3 June 2013. ^ a b c d e f Donald H. Kobe (1998). "Copernicus and Martin Luther: An Encounter Between Science and Religion". American Journal of Physics. 66 (3): 190. Bibcode:1998AmJPh..66..190K. doi:10.1119/1.18844. ^ a b Cohen, I. Bernard (1985). Revolution in Science. Cambridge, MA: Belknap Press of Harvard University Press. p. 497. ISBN 978-0-674-76778-2. ^ Owen (1869, p. 310); Rosen (1995, p. 166–67). Owen's remark appears in volume XI of his collected works, not the volume (XIX) cited by Rosen. ^ Decree of the General Congregation of the Index, 5 March 1616, translated from the Latin by Finocchiaro (1989, pp. 148–49). An on-line copy of Finocchiaro's translation has been made available by Gagné (2005). ^ Hilliam, Rachel (2005). Galileo Galilei: Father of Modern Science. The Rosen Publishing Group. p. 96. ISBN 978-1-4042-0314-3. ^ "Galileo is convicted of heresy". history.com. Retrieved 13 December 2013. ^ a b Krystyna Poray Goddu, Copernicus and the Aristotelian Tradition, BRILL, 2010, ISBN 978-90-04-18107-6, part 1, chapter 1, p. 7. ^ Jack Repcheck, Copernicus' Secret: How the Scientific Revolution Began, Simon & Schuster, 2008, ISBN 978-0-7432-8952-8, p. 32. ^ Manfred Weissenbacher, Sources of Power: How Energy Forges Human History, Praeger, 2009, ISBN 978-0-313-35626-1, p. 170. ^ Marvin Bolt, JoAnn Palmeri, Thomas Hockey, The Biographical Encyclopedia of Astronomers, Springer, 2009, ISBN 978-0-387-35133-9, p. 252. ^ Charles E. Hummel, The Galileo Connection, InterVarsity Press, 1986, ISBN 978-0-87784-500-3, p. 40. ^ Krystyna Poray Goddu, Copernicus and the Aristotelian Tradition, BRILL, 2010, ISBN 978-90-04-18107-6, chapter 6, p. 173. ^ John Freely, Celestial Revolutionary: Copernicus, the Man and His Universe, I.B. Tauris, 2014, ISBN 978-0-85773-490-7, pp. 56–57. ^ Freely, John (20 May 2014). "Celestial Revolutionary: Copernicus, the Man and His Universe". I.B.Tauris – via Google Books. ^ "Copernicus, Nicolaus", Encyclopedia Americana, 1986, vol. 7, pp. 755–56. ^ "Copernicus, Nicholas", The Concise Columbia Encyclopedia, New York, Avon Books, 1983, ISBN 0-380-63396-5, p. 198: "Polish astronomer". ^ "Copernicus, Nicolaus", The Oxford World Encyclopedia, Oxford University Press, 1998. ^ Findlen, Paula (2013). "Copernicus, Nicolaus". World Book Advanced. Archived from the original on 18 October 2015. Retrieved 31 May 2013. ^ Weissenbacher (2009), p. 170. ^ "MyHeritage – bezpłatne drzewo genealogiczne, genealogia i historia rodziny". ^ "Stammbaum, Ahnenforschung und Familiengeschichte – MyHeritage". ^ Karol Górski, Mikołaj Kopernik. Środowisko społeczne i samotność (Mikołaj Kopernik [Nicolaus Copernicus]: His Social Setting and Isolation), Toruń, Nicolaus Copernicus University Press, 2012, ISBN 978-83-231-2777-2. ^ Burleigh, Michael (1988). Germany turns eastwards. A study of Ostforschung in the Third Reich. CUP Archive. pp. 60, 133, 280. ISBN 978-0-521-35120-1. ^ Rudnicki, Konrad (November–December 2006). "The Genuine Copernican Cosmological Principle". Southern Cross Review: note 2. Retrieved 21 January 2010. ^ a b Miłosz, Czesław (1983). The history of Polish literature (2 ed.). University of California Press. p. 37. ISBN 978-0-520-04477-7. ^ a b c d Davies, Norman (2005). God's playground. A History of Poland in Two Volumes. II. Oxford University Press. p. 20. ISBN 978-0-19-925340-1. ^ Fox, Stuart (14 July 2009). "Newly Discovered Element 112 Named 'Copernicum'". popsci.com. Retrieved 17 August 2012. ^ Renner, Terrence (20 February 2010). "Element 112 is Named Copernicium". International Union of Pure and Applied Chemistry. Archived from the original on 22 February 2010. Retrieved 20 February 2010. ^ "Calendar of the Church Year according to the Episcopal Church". Satucket.com. 12 June 2010. Retrieved 17 August 2012. Armitage, Angus (1951). The World of Copernicus. New York: Mentor Books. Dreyer, John Louis Emil (1953) . A History of Astronomy from Thales to Kepler. New York: Dover Publications. Feldhay, Rivka (1995). Galileo and the Church: Political Inquisition Or Critical Dialogue?. Cambridge: Cambridge University Press. ISBN 978-0-521-34468-5. Maurice A. Finocchiaro (2010). 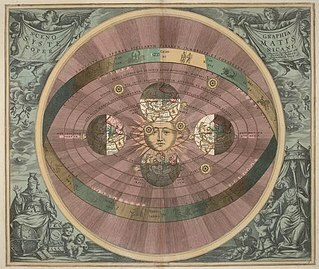 Defending Copernicus and Galileo: Critical Reasoning in the Two Affairs. Springer Science & Business Media. ISBN 978-90-481-3201-0. Graney, Christopher M. (2015). Setting Aside All Authority: Giovanni Battista Riccioli and the Science Against Copernicus in the Age of Galileo. Notre Dame, IN: University of Notre Dame Press. ISBN 978-0-268-02988-3. Johnson, Lonnie (28 September 1996). Central Europe: Enemies, Neighbors, Friends. Oxford University Press, US. ISBN 978-0-19-802607-5. Ptolemy, Claudius (1964) . Tetrabiblos. translated by F.E. Robbins (Loeb Classical Library ed.). London: William Heinemann. Rabin, Sheila (2005). "Nicolaus Copernicus". In Zalta, Edward N. The Stanford Encyclopedia of Philosophy (Summer 2005 ed.). Retrieved 26 May 2008. Rosen, Edward (1995). Hilfstein, Erna, ed. Copernicus and his Successors. London: Hambledon Press. Bibcode:1995cops.book.....R. ISBN 978-1-85285-071-5. Rosen, Edward (translator) (2004) . Three Copernican Treatises:The Commentariolus of Copernicus; The Letter against Werner; The Narratio Prima of Rheticus (Second Edition, revised ed.). New York: Dover Publications. ISBN 978-0-486-43605-0. Russell, Jeffrey Burton (1997) . Inventing the Flat Earth – Columbus and Modern Historians. New York: Praeger. ISBN 978-0-275-95904-3. Valls-Gabaud, D.; Boskenberg, A., eds. (2009). The Role of Astronomy in Society and Culture. Proceedings IAU Symposium No. 260. Westman, Robert S. (2011). The Copernican Question: Prognostication, Skepticism, and Celestial Order. Los Angeles: University of California Press. ISBN 978-0-520-25481-7. Erasmus Reinhold was a German astronomer and mathematician, considered to be the most influential astronomical pedagogue of his generation. He was born and died in Saalfeld, Saxony. Aristarchus of Samos was an ancient Greek astronomer and mathematician who presented the first known heliocentric model that placed the Sun at the center of the known universe with the Earth revolving around it. He was influenced by Philolaus of Croton, but Aristarchus identified the "central fire" with the Sun, and he put the other planets in their correct order of distance around the Sun. Like Anaxagoras before him, he suspected that the stars were just other bodies like the Sun, albeit further away from Earth. His astronomical ideas were often rejected in favor of the geocentric theories of Aristotle and Ptolemy. Nicolaus Copernicus attributed the heliocentric theory to Aristarchus. In astronomy, the geocentric model is a superseded description of the Universe with Earth at the center. Under the geocentric model, the Sun, Moon, stars, and planets all orbited Earth. 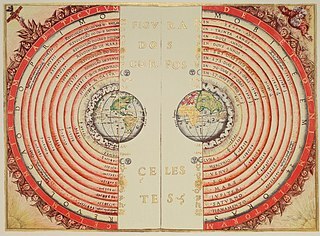 The geocentric model served as the predominant description of the cosmos in many ancient civilizations, such as those of Aristotle and Ptolemy. Heliocentrism is the astronomical model in which the Earth and planets revolve around the Sun at the center of the Solar System. Historically, heliocentrism was opposed to geocentrism, which placed the Earth at the center. The notion that the Earth revolves around the Sun had been proposed as early as the 3rd century BC by Aristarchus of Samos, but at least in the medieval world, Aristarchus's heliocentrism attracted little attention—possibly because of the loss of scientific works of the Hellenistic Era. De revolutionibus orbium coelestium is the seminal work on the heliocentric theory of the astronomer Nicolaus Copernicus (1473–1543) of the Polish Renaissance. The book, first printed in 1543 in Nuremberg, Holy Roman Empire, offered an alternative model of the universe to Ptolemy's geocentric system, which had been widely accepted since ancient times. Tiedemann Giese, was Bishop of Kulm (Chełmno) first canon, later Prince-Bishop of Warmia (Ermland). His interest in mathematics, astronomy, and theology led him to mentor a number of important young scholars, including Copernicus. He was a prolific writer and correspondent, publishing a number of works on the reformation of the church. 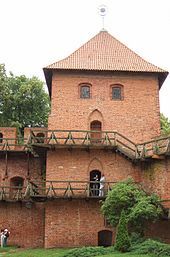 Tiedemann was a member of the patrician Giese family of Danzig (Gdańsk) in Poland. The Giese family ancestors originated from Unna in Westphalia, near Cologne. His father was Albrecht Giese and his younger brother, the Hanseatic League merchant Georg Giese. The Galileo affair was a sequence of events, beginning around 1610, culminating with the trial and condemnation of Galileo Galilei by the Roman Catholic Inquisition in 1633 for his support of heliocentrism. Lucas Watzenrode the Younger was Prince-Bishop of Warmia (Ermeland) and patron to his nephew, astronomer Nicolaus Copernicus. Achilles Pirmin Gasser was a German physician and astrologer. He is now known as a well-connected humanist scholar, and supporter of both Copernicus and Rheticus. De libris revolutionum Copernici narratio prima, usually referred to as Narratio Prima, is an abstract of Nicolaus Copernicus' heliocentric theory, written by Georg Joachim Rheticus in 1540. It is an introduction to Copernicus's major work, De revolutionibus orbium coelestium, published in 1543, largely due to Rheticus's instigation. 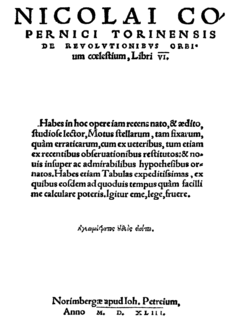 Narratio Prima is the first printed publication of Copernicus's theory. Copernican heliocentrism is the name given to the astronomical model developed by Nicolaus Copernicus and published in 1543. It positioned the Sun near the center of the Universe, motionless, with Earth and the other planets orbiting around it in circular paths modified by epicycles and at uniform speeds. The Copernican model displaced the geocentric model of Ptolemy that had prevailed for centuries, placing Earth at the center of the Universe. It is often regarded as the launching point to modern astronomy and the Scientific Revolution. The Prutenic Tables, were an ephemeris by the astronomer Erasmus Reinhold published in 1551. They are sometimes called the Prussian Tables after Albert I, Duke of Prussia, who supported Reinhold and financed the printing. Reinhold calculated this new set of astronomical tables based on Nicolaus Copernicus' De revolutionibus orbium coelestium, the epochal exposition of Copernican heliocentrism published in 1543. Throughout his explanatory canons, Reinhold used as his paradigm the position of Saturn at the birth of the Duke, on 17 May 1490. With these tables, Reinhold intended to replace the Alfonsine Tables; he added redundant tables to his new tables so that compilers of almanacs familiar with the older Alfonsine Tables could perform all the steps in an analogous manner. The Nicolaus Copernicus Monument in Warsaw is one of the Polish capital's notable landmarks. It stands before the Staszic Palace, the seat of the Polish Academy of Sciences on Krakowskie Przedmieście. Designed by Bertel Thorvaldsen in 1822, it was completed in 1830. Astronomer Copernicus, or Conversations with God is an oil painting by the Polish artist Jan Matejko, finished in 1873, depicting Nicolaus Copernicus observing the heavens from a balcony by a tower near the cathedral in Frombork. Currently the painting is in the collection of the Jagiellonian University of Kraków, which purchased it from a private owner with money donated by the Polish public. The center of the Universe is a concept that lacks a coherent definition in modern astronomy; according to standard cosmological theories on the shape of the universe, it has no center.